Its been a fun two and a half years at Comcast. Well, crazy at times but when you lean back and look at the big picture, it does feel amazing to have created applications that, well, are so much fun!. So I decided to write a post on it and since we are looking for new talent as well, ping the blogosphere to see if anyone wants to join our growing team. First of all a disclaimer: this is a personal blog entry and please do not put comments in here that should be directed to Comcast. I am putting this up for a few friends and as a personal archive as well so that I can look at it 5 years down and be like: “oh yeah that was fun”. 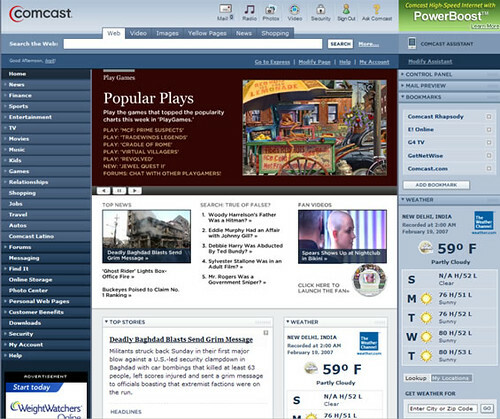 When I joined Comcast, we were launching what is now the current portal. 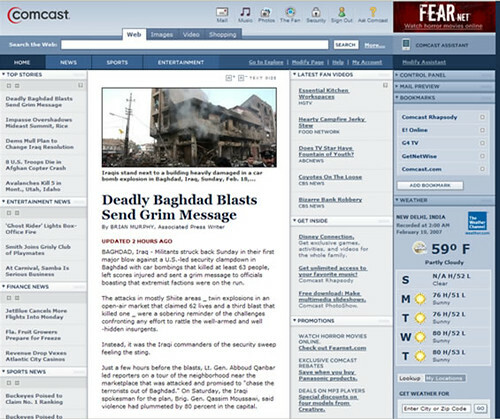 Way back then when Flash 7 had just about come out, to make that the technology on the homepage of one of the top most traffic-ed websites took guts. But we did launch Comcast explore and Comcast Express. Running on an elaborate AS2 architecture, with interactive modules pinging a large number of services for weather, movies etc and elaborate personalization features, the portal still is used in conversations as a testament to the power flash had even 2 years ago. While explore was 80% flash, Comcast express was a 100%-flash news based RIA. One of the most famous icons of the Comcast portal is the circular video player called the Fan. Early 2006, Fan 3.0 was launched. The fan is probably the most unique RIA out there. With features like drag and drop enabled blades as a metaphor for rearranging and managing playlists, video search, playlist integration and a more conventional view for the more traditional video watcher, the fan is definitely one of the most unique apps out there. The fan also won the peoples’ choice award at Flash Forward 2006 at Austin. This is definitely my fave project here. 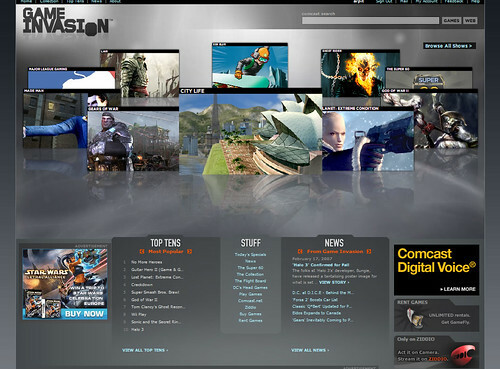 When we developed gameinvasion, the flash team was called on to implement a compelling entry point experience for the application. The result was the circular navigation for the top 10 shows of the day (hmm…circles again, I am sensing a theme here;) ). The shows themselves are once again 100% flash applications giving users the ability to browse images,reviews and videos on the latest games. Its always great to be able to say you are debugging an app when you are watching Master Chief kick @$$ :D.
Ziddio, which came out recently, is a beta application that allows users to upload their videos for online contests and win amazing prizes….plus winners get their videos on the Comcast on demand channel. Now where is my camera…. There are a lot of really cool projects coming out soon. If you are into flex, then you’ll love some of the new things that come out. In the meanwhile, keep your eyes on labs.comcast.net. Oh and while you are at it, check out my previous entry on my return to work after vacation, just to show how crazy we really are :). In the meanwhile if you are interested in joining my team, do drop me an email at arpit_mathur [ at ] comcast.net. Great post Arpit 🙂 Ya know what – I’m just going to quote the whole thing when I get the chance. There is no doubt that Game Invasion is a hell of an achievement. Very nice work.